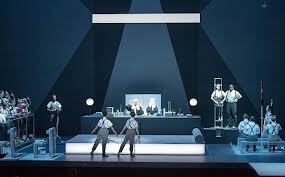 I had the pleasure of seeing the recent production of the Philip Glass/Robert Wilson “opera” ‘Einstein on the Beach’ in Berkeley on October 28th. I had seen the production at the Brooklyn Academy of Music 20 years ago and have loved the music since I first bought the recording issued on the short-lived Tomato record label (this is the performance now available on Sony). It is clearly a work which compels me and has insinuated itself into my world view. The production was beautiful. The musicians as always played well under the precise and confident direction of Michael Riesman who has apparently conducted every performance of the opera (that alone is an astonishing feat). 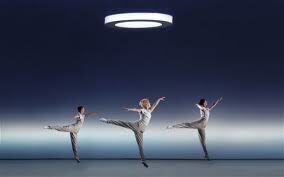 The dancers were spectacular in their execution of Lucinda Childs’ unusual choreography. And the solo violin played in this production by violinist Jennifer Koh breathed a new virtuosic life into the familiar solo part. The set design and lighting were about as good as it gets and the performers appeared to be well rehearsed and operated as well oiled parts of the unified whole of the machine that is Einstein on the Beach. It was a production that was loving and well received by the audience (a genuinely appreciative standing ovation followed the performance) in this, the west coast premiere of this landmark piece from 1976. It is certainly worth noting that it took 36 years for this to be produced in even this most liberal of musical places. I have hesitated to write about this performance partly because I didn’t want to simply report my attendance and geeky satisfaction. I wondered if everything has already been said ad nauseam about this piece and adding yet another adoring review would be pointless and dull. But the performance (all 4.5 hours of it) left me with a renewed appreciation for the music and the visuals. It reinforced my belief that this is a truly significant work of art and that it will continue to be revived. However it is likely that this is the last revival we will see which has been supervised by the original creators. 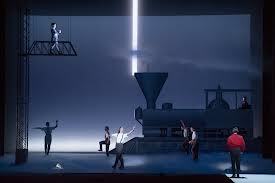 Philip Glass is 75 and Robert Wilson is 71. Lucinda Childs is 72. And there is at the time of this writing no heir apparent for the Philip Glass Ensemble. The vaguely apocalyptic themes provide a sort of commentary for our times. Like any great work of art it continues to take on meaning for subsequent generations. It is both a response to the milieu in which it was created and a mirror in which is reflected the present time of its performance. Don’t get me wrong. This avant-garde masterpiece is hardly easy listening or easy viewing. In addition to its length it is non-linear, devoid of plot and devoid of most of the conventions by which we normally judge and appreciate both theater and music. But it has been embraced by many. Mark Jacobs’ Spring/Summer 2012 Fashion Show featured models walking up and down the runway to the sound of the opening “1, 2, 3, 4…” of the solo chorus which opens the work. 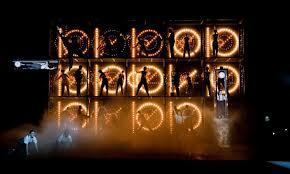 A Pepsi commercial from 2008 titled ‘Einstein’s Choice’ also featured that same chorus. And the incidental music to any number of nature programs are frequently infused with the now familiar arpeggios endemic to Philip Glass’ compositional style. Combine these things with the fact that revivals of this opera play to nearly or completely sold out houses in New York, France, Berkeley, Mexico City, Amsterdam and Ann Arbor, Michigan. Granted the revivals are infrequent, the last being 20 years ago, but the draw of this work apparently remains strong suggesting that it is now and will likely remain in the repertoire. I came away from this production with a sense of exhilaration that I feel when I encounter a great performance of a masterpiece by Mozart, Beethoven or John Coltrane, a sense of connection to a greater meaning such as one finds in all great works of art be they music, theater, painting, literature, film, etc. And I don’t think I am alone in having felt that. When I first began listening to this piece in the aforementioned Tomato recording I was both fascinated and perplexed. I felt compelled to listen again and again and was perplexed at what I was hearing. But history tells us that few seem to fully appreciate great art at the time of its emergence, that such appreciation takes time. With time and repeated listenings I began to find the work grow on me, become familiar. Seeing the 1992 revival in Brooklyn only further reinforced my sense that this is a very significant work and it remains one of my favorite pieces of music. It is one of the pieces of music that feels to me like a personal discovery, one which I seem to have appreciated to some degree from my first encounter with it. 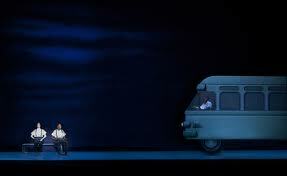 And my understanding as well as my affection for this work has only increased with time. What remains to be seen is whether this work can continue to be successful in subsequent productions done by people whose connection to the work is less direct and whether it can continue to speak to subsequent generations. The majority of the crowd at Zellerbach hall for this performance appeared to be in the 40 to 50+ category which may be in part due to the cost of a ticket. I hope that it is not lack of interest. For years, until the new recording was released on Nonesuch Records in 1993, I listened to the 1979 release which, due to the length of the music, abbreviated some of the repetitions to allow the recording to fit on 4 vinyl discs. It is this recording which I know best and is most deeply imprinted on my memory. Of course the experience is quite different with the accompanying visuals. I had learned to appreciate the music alone with just of few still photos to kindle my imagination as to how the full production would appear. And, not surprisingly, my first encounter with the full production in 1992 exceeded my expectations and provided a new and richer perspective on the meaning of this opera. When I say “meaning” I am referring only to the meaning which I experience. I don’t lay any claim to any special knowledge here. And I think that this and all great works of art sustain their worth through their ability to mean and be associated with a variety of things. Einstein has different meanings and associations for each individual and perhaps no ultimate “meaning”. Even the texts associated with the piece are intentionally non-linear, make few concrete references to culture as a whole. There is no story here, there are only visual images, sonic images and a variety of spoken words which, while in English, have mostly vague meanings. The issue here is the emotional impact.